Between busy December and the weather keeping me out of the garden, it's a challenge to find enough photos to post for Wildlife Wednesday in January so I usually come up with something a little different than documenting my wildlife visitors. This month I'm joining Tina at "My Gardener Says..." with a look back at a year of favorites from my 2016 posts. 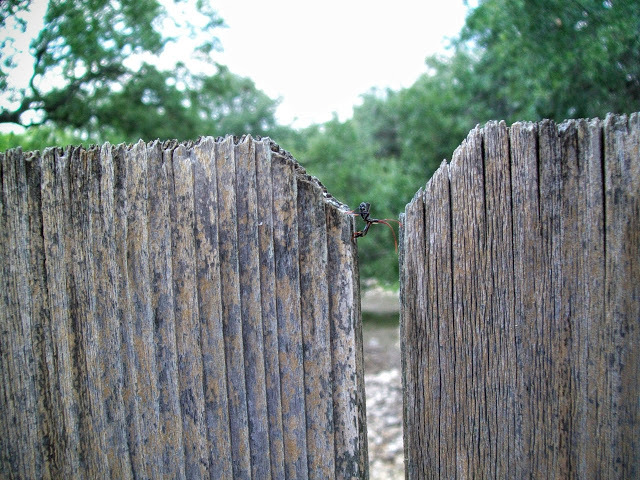 As mentioned above, January is a challenge so for January 2016 I went to the archives and shared photos like this acrobatic spider bridging a gap in the old fence from before I began my blog. The fence was replaced with a garage so the view is quite different now. Many of my wildlife visitors sport various forms of camouflage. 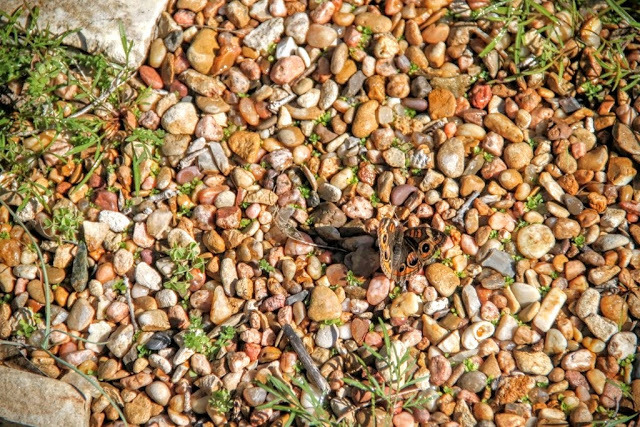 The Common Buckeye butterfly has to be one of the best especially when dabbing in the damp gravel. I'm so glad I added Damianita to my garden. 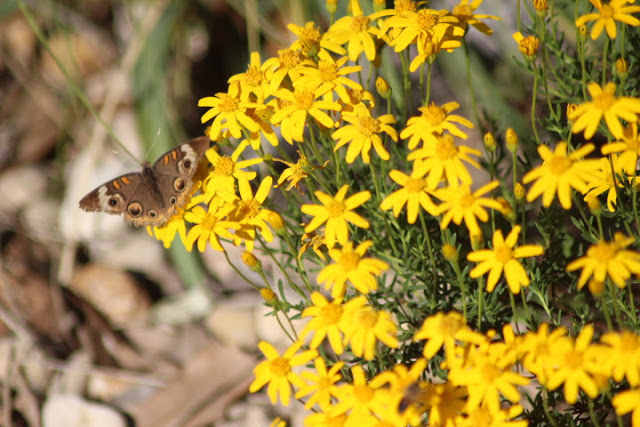 This small evergreen native shrub looks great all year and attracts wildlife like this not-so-camouflaged Common Buckeye featured in my April post. Those eyes on its back would still confuse a predator. A warbler turned up in the May garden. 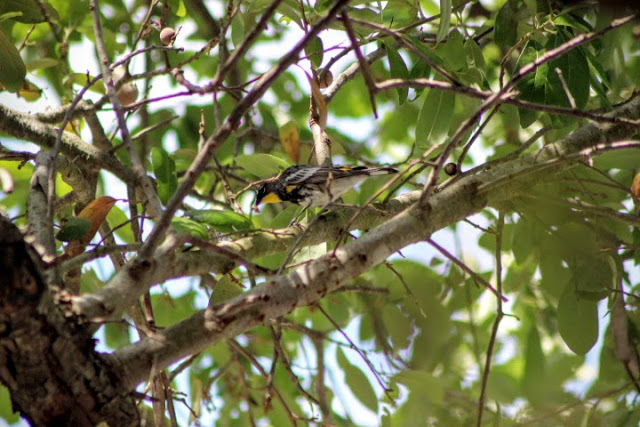 Warblers are not uncommon in San Antonio though sightings in my neighborhood are infrequent. After some email discussion with a reader we think it might be an Audubon Warbler though it's not positive. 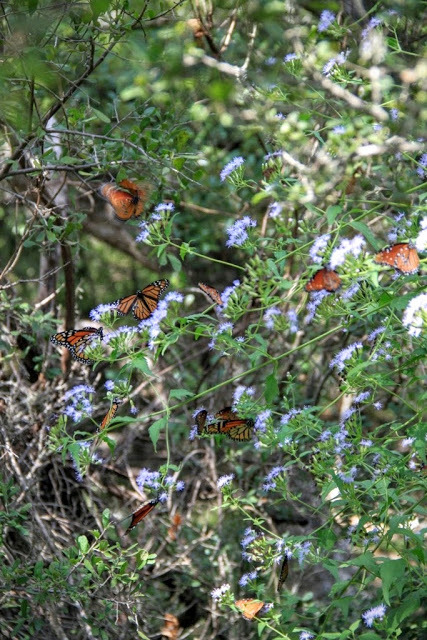 I've mentioned before that I didn't start out to create a butterfly garden, it just happened to work out that way. 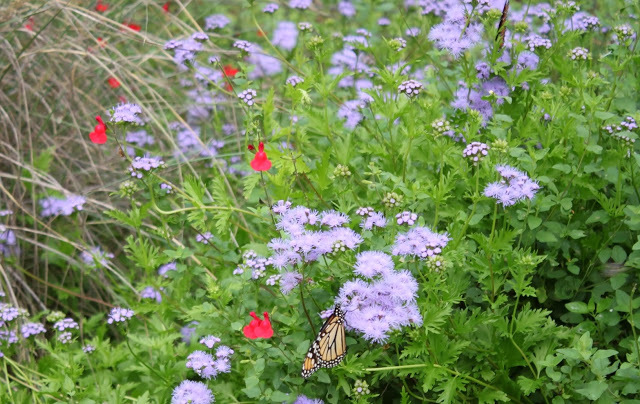 The more tough native flowering plants I added the more butterflies turned up. In the case of this Greenthread wildflower, I didn't even add it to my garden. They just seeded themselves over from a nearby field and joined the party. We tend to think of Cardinals as winter birds with their bright red plumage standing out when the garden is at its dullest. 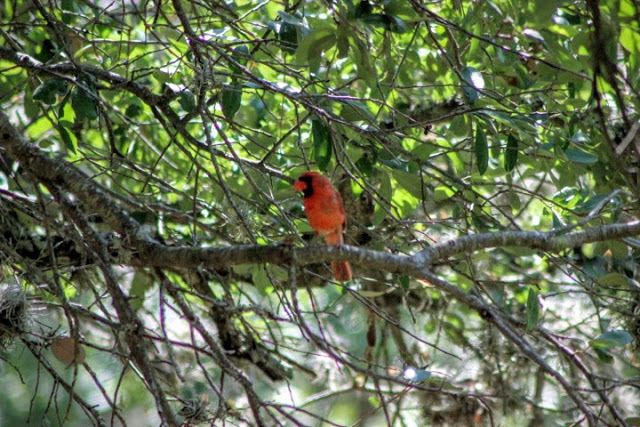 This Cardinal was quite outstanding with a backdrop of green live oak leaves in July. 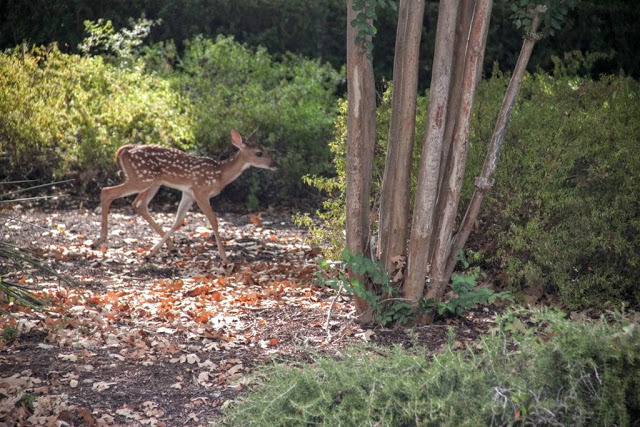 Too hot to chase butterflies and bees so I posted a deer story featuring our neighborhood Whitetail Deer. I try to feature a new deer photo on each Wildlife Wednesday post. It's pretty easy since the deer are always around. They migrate away for a few weeks but always come back. 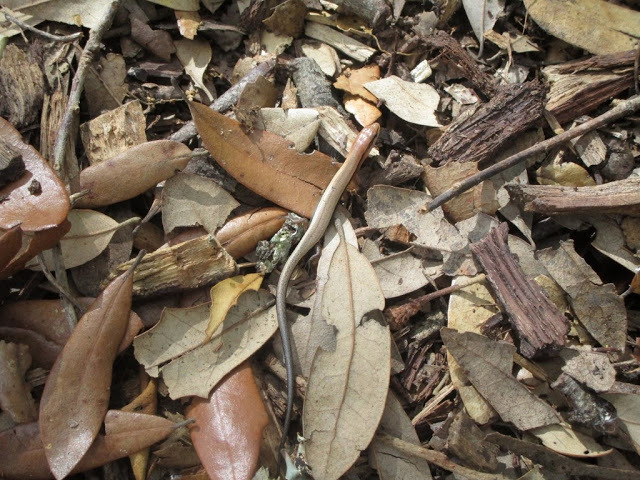 September featured a skink. Skinks are fast and wiggly. I'd chased them around the garden with a camera for several years until finally one slowed down enough to make it to Wildlife Wednesday. It's an accomplishment that other bloggers would understand (maybe). They eat cockroaches if that helps. 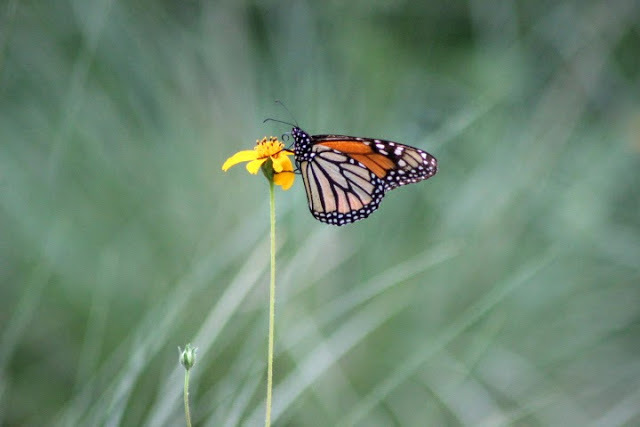 I changed things up a bit and featured five recommended plants for Monarch butterflies in my garden. I also observed that these plants may or may not be in bloom when the Monarchs show up so see November for my butterfly favorite. Monarch butterfly numbers may be down overall but I saw many more during this year's fall migration than in the past few years. Crucita or Chromoleana odorata could be the reason, it's delicate blue blooms are apparently addictive. 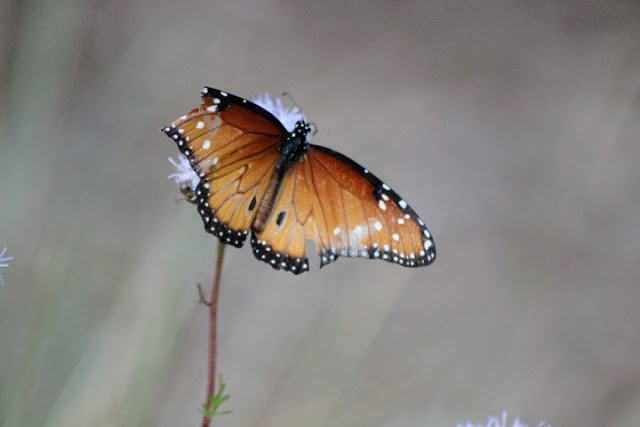 A tattered butterfly reminds me of the end of another blogging year. Out with the old and in with the new. Looking forward to blogging more from my garden in 2017! Be sure to join Tina at "My Gardener says..." to see more garden wildlife.